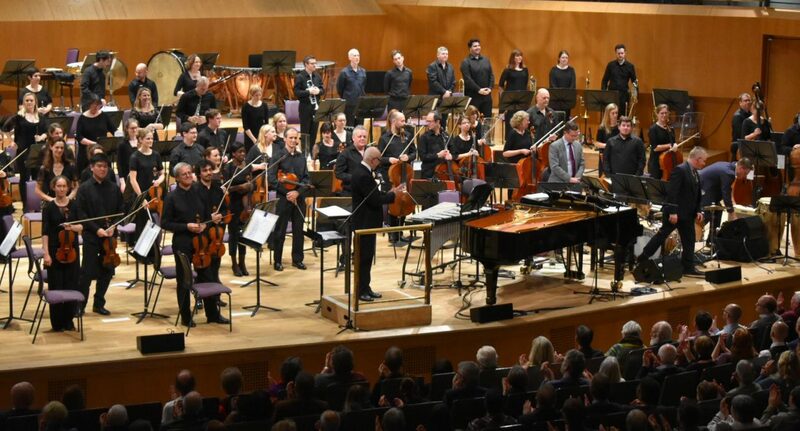 The James Pearson Trio joined musical forces with The Hallé Orchestra once more for Take Two of the Giants of Jazz show at the Bridgewater Hall. The ensemble returned to the beautiful theatre following sell-out success, the Trio making the journey up from the famous London jazz club Ronnie Scott’s, where they are the house band. The show featured arrangements of jazz standards adapted for the trio, the orchestra, and the two together. Wearing clothes I actually bothered to clean beforehand and being the only audience member with any colour left in my hair was a markedly different experience to that of my usual student gigs. With the band entering onto stage with sartorial decisions smarter than Einstein, however, this modification to my usual Saturday nights suddenly did not feel so out of place. If there ever were a live performance called “Now That’s What I Call Jazz”, this would be it. This was a greatest hits of the greatest genre: Erroll Garner’s Misty lead us in, followed by classics from Fats Waller, Thelonious Monk, and Duke Ellington. The Hallé Orchestra were, as expected, superbly harmonious to the note, and the Trio provided improvisation and individual virtuoso galore. One unexpected highlight was the discussions of performers between songs. Conductor Roderick Dunk and Trio leader James Pearson in particular succinctly described various playing styles of jazz through the ages, and the characters behind them, providing key insight of the progression of the genre from nightclubs to the orchestra. It was fantastic to hear their stylistic descriptions and examples immediately come to life in the musical performances soon after, growing to be an integral part of the show. After the intermission came the high points of the show: first, a serene rendition of Bill Evans’ ‘Time Remembered’, followed by an outstanding saxophone performance for Dave Brubeck’s wonderful ‘Take Five’. The trio then even performed their own original compositions, featuring wonderful instrumental performances from each member: drum fills, double bass slides, electric guitar riffs, and excellently complicated piano breezes. With a tremendous and well-balanced range of classics performed by an orchestra of the highest standards, alongside one of the most famous jazz club house bands in the country, a show like Giants of Jazz is one that is not to be missed for those with even a passing interest in jazz music. To go buy a ticket for a show like this might not be the most student-like decision you will ever make, sure; but if you feel tired of living life as nothing more than a picture-perfect Fallowfield stereotype, then this might be the show for you. What’s all that jazz about anyway?